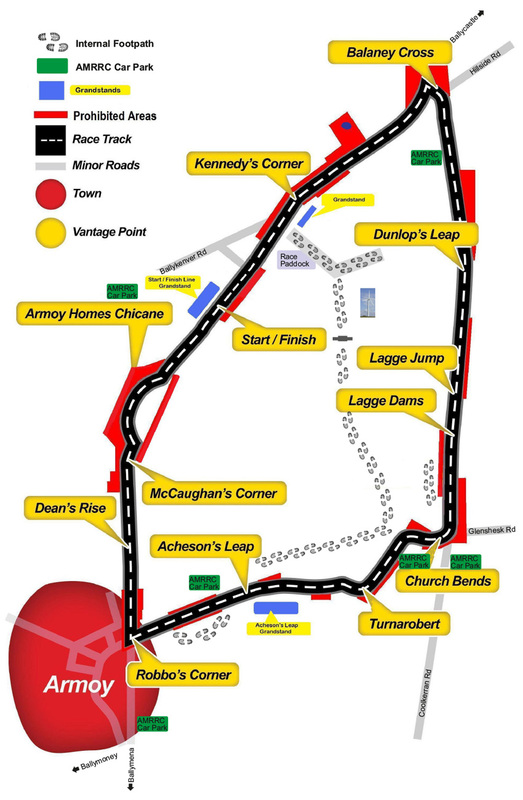 The Armoy Race Circuit is 3.03 miles long and Triangular in shape. It is ridden in an anti-clockwise direction. The Grid is set up in a Grand Prix style, with 3 groups of nine riders up to a maximum of 27 riders starting each race. Hillside Road, Glenshesk Road and Lagge Road often used by the Armoy Armada to test their bikes on, are still the same roads used today for the Official Armoy Road Races. The Armoy Homes chicane was introduced in 2010 as a new safety feature. Designed for purpose and built on ground sponsored by Armoy Homes the chicane has proved to be one of those features that you either love or hate. The facts are clear, safety has been improved while the sight of nine (9) racers jostling for position is simply breathtaking. There is viewing on the inside of the course. McCAUGHAN’S CORNER is named after the family who live in the house on this corner. It is a Fast Left Hand Corner and the fields on the inside of the circuit offer excellent viewing. The area after the house on the right hand side (outside of the corner) is a Prohibited area. DEAN’S RISE is after McCaughan’s and is another Fast Left Hand Corner approaching the village of Armoy, again viewing here is ONLY on the inside of the circuit. The fields on the right of the circuit (outside of the circuit) are a Prohibited Area. ROBBO’S CORNER is named after the Armoy Armada’s Mervyn Robinson. It is a very Sharp left hand corner, in the centre of Armoy Village opposite the Armada Bar before the bikes head up Glenshesk Road towards the Cuttings. There is good viewing at Robbo’s from either side of the track, there is a garage forecourt on the inside of the circuit and there is the side of the Armada Bar on the corner of Main Street. There is safety barriers in use at this area. The Main Road (Drones Road) is used as a Run Off Area (150mtrs) and is prohibited to spectators. THE CUTTINGS is the walled grass banking’s on either side of Glenshesk Road after St. Olcans school and church hall. The Trees here give a tunnelled effect and the sound of the bikes accelerating up Glenshesk is heard halfway up the Glen. Truly awesome. Spectators are diverted in through gates at the foot of the cuttings and guided up behind to an exit gate at the top of the cuttings. Please observe the instructions from the Marshal’s. Above the Cuttings on the left hand side is a car park designated field, positioned on the edge of the circuit. There is ample room for Car’s, Motorhomes and Disabled Parking. There is a small corner in the field a Prohibited Area, but this is because you are so close to the race action. After the Cuttings & the Car Park is a Right Hand Bend before coming to ACHESON’S LEAP with a Quick Jump, twisting left and heading downhill it’s quite spectacular viewing if not a little hairy for the Riders. Acheson’s is named after the family at Turnarobert house and the farm here, you are on their property please use good country practise and close gates, use the fence styles and bin your litter. TURNAROBERT is a Right then Left Corner all heading Downhill with a bit of a twist in the road that makes it hard on the front end of the bikes. There is excellent viewing on the hill at Turnarobert on the left, the right hand side (outside of the corner) is a Prohibited Area. After Turnarobert it’s onto Church Bends. CHURCH BENDS is as it suggests, is a Tight Right Hand Corner followed by Two Sweeping Left Hand Corner’s that curls around the Church on Glenshesk Road. This is also the site of “The Round Tower” a significant landmark around Armoy. The Church grounds is a Prohibited Area for obvious reasons, although there is fantastic viewing in the field opposite the church as well as a towering look at Church Bends from the field on Coolkerran Road which sits high above the whole area giving a birds eye view of the bikes approaching and exiting the church bends and heading past Barley Brae and up to the Lagge Dams. The Field on Coolkeeran Road is also a Car Park on Race Day. LAGGE CROSS is the crossroads where Glenshesk, Lagge and Coolkeeran Road meet. Above the Lagge Cross, and behind the church grounds is BARLEY BRAE a natural bank on the inside of the track giving a good observation area high above the circuit. After Lagge Cross the Riders head along THE LAGGE DAMS, the terrain on the right hand side is hilly and overgrow with mature trees and is of no use for viewing. The Road at the Lagge Dams is the narrowest part of the circuit and there is no trackside viewing. There is an area on the left hand side that is a prohibited area. Lagge Dams is the narrowest part of the circuit. Lagge Road is just over a mile long with Dips and Jumps and an uphill stretch that has DUNLOP’S LEAP at it peak. There is various viewing points on both sides of the road but viewing at Dunlop’s Leap is only allowed on the inside (left) of the circuit. The right hand side of Dunlop’s Leap is a Prohibited area. Below Dunlop’s Leap is Dennis McMichael’s house and Dennis offers Disabled and Motorbike parking with great views of the bikes flying over the Leap, he also makes a good cup of tea. All Monies collected at Dennis’s is for charity. Then It’s downhill towards BALANEY CROSS, this is the Junction where Lagge Rd joins back onto the main Hillside Road. The Balaney Cross Junction is a Hairpin Type Corner. For the Riders It’s hard on the brakes then turn on the power as they enter Hillside Road with the first sweeping right hand corner only yards from Balaney Cross. There is Viewing & Car Parking on the inside of the course. The right of Balaney Cross is a Prohibited Area. HILLSIDE ROAD is the fastest part of the circuit. This is the main road from Ballycastle to Armoy with Knocklaide Mountain in the background. There is viewing at several places on Hillside with both Spectator Area and Prohibited Areas clearly marked. KENNEDY’S CORNER is a great Left Hand Corner after the Dip in Hillside Road and at the junction of Ballykenver Road (the return to paddock road). The Speed and Angle of the Riders going round Kennedy’s is a racing spectacle to be seen. Viewing here is strictly on the Inside of the Track Only. The Right hand side (Outside of the Corner) is a Prohibited Area. The return to paddock lane is coned off, one side for motorbikes to return to paddock and the other side is access for Spectators. Care should be taken here at all times and children must be under adult supervision. After Kennedy’s Corner it’s “Full of the Pipe” to the FINISH LINE, back where we started. Between Kennedy’s and the Start – Finish Line, is a small road on the right hand side. This is used as the DUMMY GRID for the Riders to prepare for the next race. The Dummy Grid is a Restricted Area and ONLY race personnel are Permitted. Care must be taken at all times here. The PADDOCK AREA is located behind Race Control. Spectators are welcome to wander around the Paddock and talk with racers and part with your cash at Burger vans, Merchandise tents and Programme sellers (in fact we encourage it) but do please take caution around this area as there may be moving vehicles etc. Children must be kept under supervision at all times. Adults are reminded to keep children under your supervision at all times. Whilst it may appear that there is a lot of Prohibited Areas around the Armoy Race Circuit bear in mind that the circuit is over 3 miles long and that there is unlimited viewing on theINSIDE of the circuit with designated SPECTATOR AREAS on the Outside of the circuit. Road Racing is a dangerous sport and everyone’s safety is our priority.